All the hopes laid upon the blurry detail of a photograph taken in Morocco of a girl who appeared to resemble missing British toddler Madeleine McCann faded as British journalists reported that the girl is the daughter of a local olive farmer. The photo, taken by Spanish tourists in northern Morocco last month and widely published on the Internet, testified to the international frenzy that the McCann case has sparked. Many people worldwide have hoped for signs that Madeleine is alive more than four months after she went missing from a Portuguese resort. The photo, in which only vague outlines of the face were visible, featured a group of people and woman with a fair-haired child on her back. It did not suggest any effort to keep the girl's face hidden. Interpol said its office in Madrid, Spain, had received "a number of photographs from members of the public of potential Madeleine sightings, including the picture taken in Morocco by a Spanish couple." The international police organization, based in the southeastern French city of Lyon, said the photos had been forwarded to Portuguese police, who are leading an investigation into the girl's disappearance. Moroccan security officials told The Associated Press that police in the North African kingdom had not received any formal requests to investigate the matter. Portuguese police declined to comment on the grounds that an investigation was continuing. British news reports appeared to dash any sign of optimism Wednesday. Rashid Razaq, a reporter from Britain's Evening Standard newspaper said he saw the girl pictured in Morocco on Wednesday: "She has got a resemblance to Madeleine but when you see her properly, it is obvious it isn't her." Razaq reported that the girl in the picture was 5-year-old Bushra Binhisa, the daughter of a local olive farmer in the town of Zinat, about 15 kilometers (10 miles) south of Tetouan. "Clearly, if these reports that the girl in the photograph isn't Madeleine are true, it is disappointing news," said Clarence Mitchell, a spokesman for Madeleine's parents. He said the couple has decided not to comment on reported sightings of Madeleine. Madeleine vanished from the Portuguese resort Praia da Luz on May 3, soon before her fourth birthday. Portuguese police have named the girl's parents, Kate and Gerry McCann, as official suspects in the disappearance. The couple said they had left the girl and her younger twin siblings asleep in their rented villa while they had dinner nearby. Despite an extensive search and a worldwide publicity effort led by her parents, no confirmed trace of the child has turned up. Mitchell, speaking on Britain's Sky News, said the release of the photo could refocus public attention to the search and "away from all the speculation and ill-founded gossip that has surrounded this in recent weeks." "Each day that passes without her body being found actually means it's a day closer to her being brought home alive and well," Mitchell said. 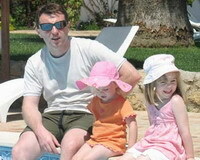 But the McCanns, he added, experienced an "emotional roller coaster .... each time this sort of information comes in." Alleged sightings of the girl have already been reported in Europe and Morocco. The area in which the photograph was taken is known for European influences, and fair-haired children with light-colored eyes are relatively common there. The photo was taken through a car windshield at a distance of several dozen meters (yards), and the resemblance to Madeleine was only clear upon zooming up on the image.